Home » ★☆☆☆☆ » Marani. A Georgian Tragedy. I wanted to like it, I really did. I’d been angling to go to Marani, a Georgian restaurant, ever since reading a glowing review and I suggested to my good friend M that we go together. M is not only a brilliant dinner companion but also Georgian. Result. First signs were promising, if slightly bizarre. I was asked if I was happy with the table I was shown to.I said I was waiting for someone and I had a chat with the friendly waitress. She’d noticed me staring at the large mural opposite and particularly the real rifles embedded into the walls, which I feel is a rather unique design feature. A few minutes later I was asked if I was ready to order. After three attempts, I managed to persuade the waitress that I wanted to wait for my friend. At the next table, three slightly excitable men had arrived and were talking about their prison experiences. It became difficult to concentrate on the menu. Given my well-developed control freakery, it will surprise those of you who know me that I would surrender all menu power to M. I’m not sure when that last happened. Perhaps when I was about 3. Probably not even then. Looking at the menu, M was delighted to see various Khachapuri at the top. We had the Imeruli. 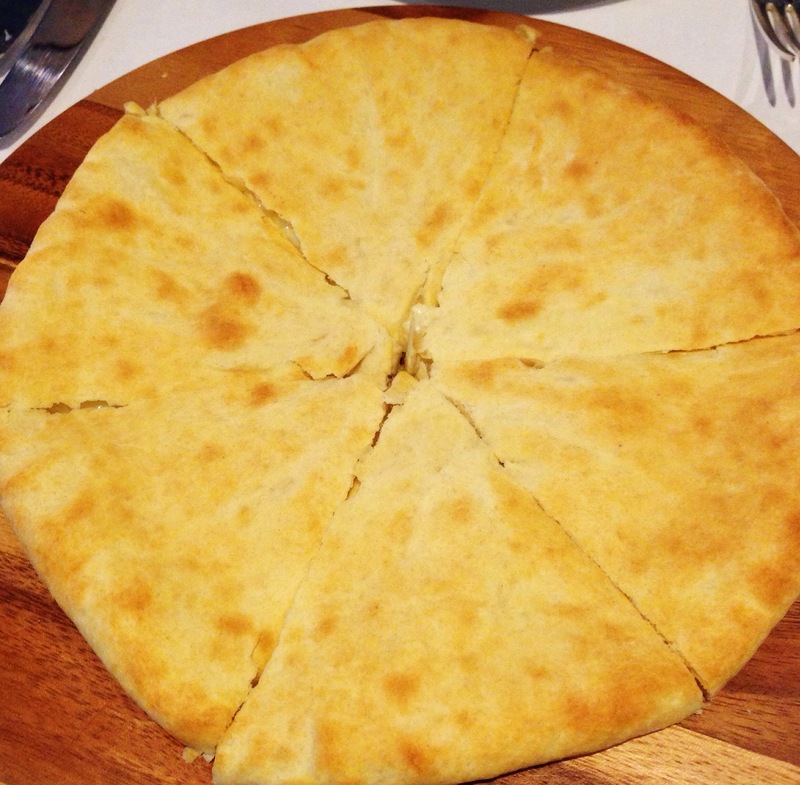 It’s a traditional Georgian cheese and egg bread; flat, stuffed with melted cheese, like a soft calzone. Delicious. Another version is the Ajeruli, named after the region. My family ruled that, says M, casually. I forgot to mention that she is a Georgian Princess. We had Mixed Pkhali to accompany the bread. Three small dishes. Spinach and walnut in one, a little too fridge-cold with a strange aftertaste we thought might have been from raw walnuts. M: this isn’t how it’s supposed to taste, it tastes of practically nothing. 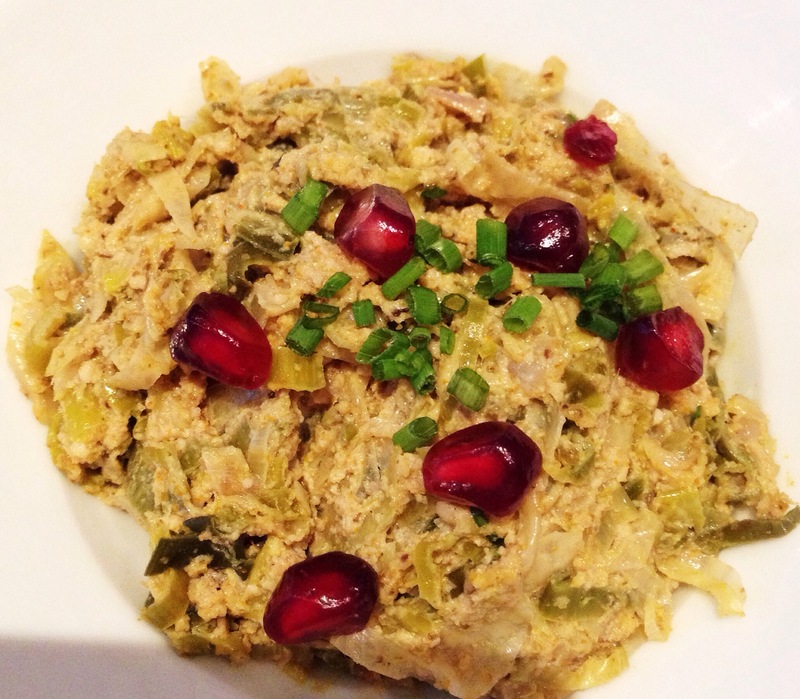 The artichoke and walnut salad was delicious. 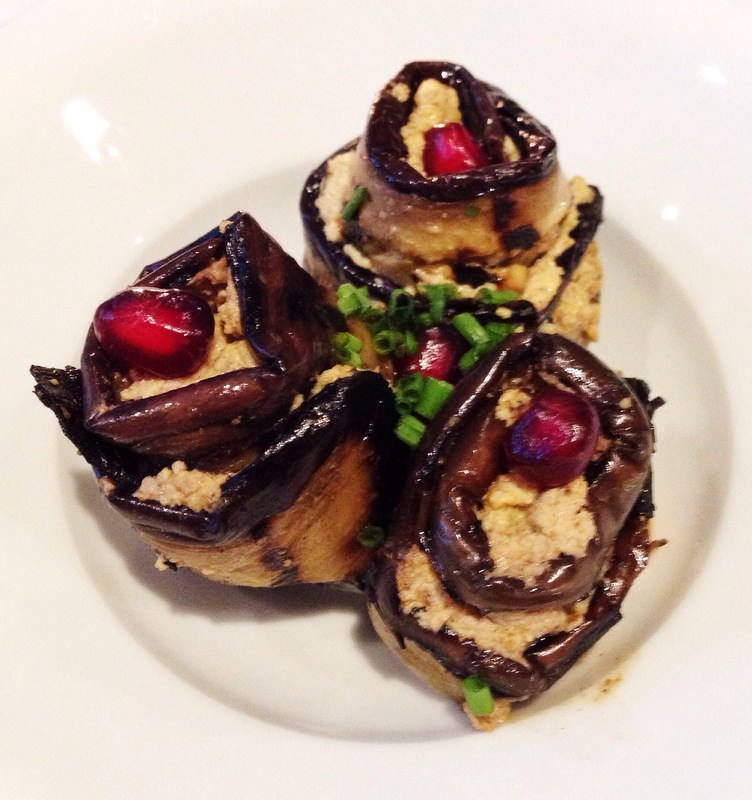 The cold aubergine stuffed with walnuts was fine but the dishes were quite small ( M: not very Georgian-generous). It’s a Georgian tradition not to clear any uneaten food from your first course, in case you don’t like what follows. I thought it was a lovely idea. I didn’t realise it was going to be essential. The Khinkali, traditional meat dumplings, were large soft purses, filled with meat (beef, as far as I could make out) flavoured with coriander and red peppers. M: red peppers are not authentic. Insides, the meat sits in gravy, so you have to eat these rather carefully. I’m glad that I was warned, otherwise I could quite easily have been wearing most of the gravy down my front: not a good look. Less delicious was the Lobio, Kidney Beans seasoned with Georgian Spices, served with Mixed Pickles. This normally comes with a sharp plum condiment, I am advised. 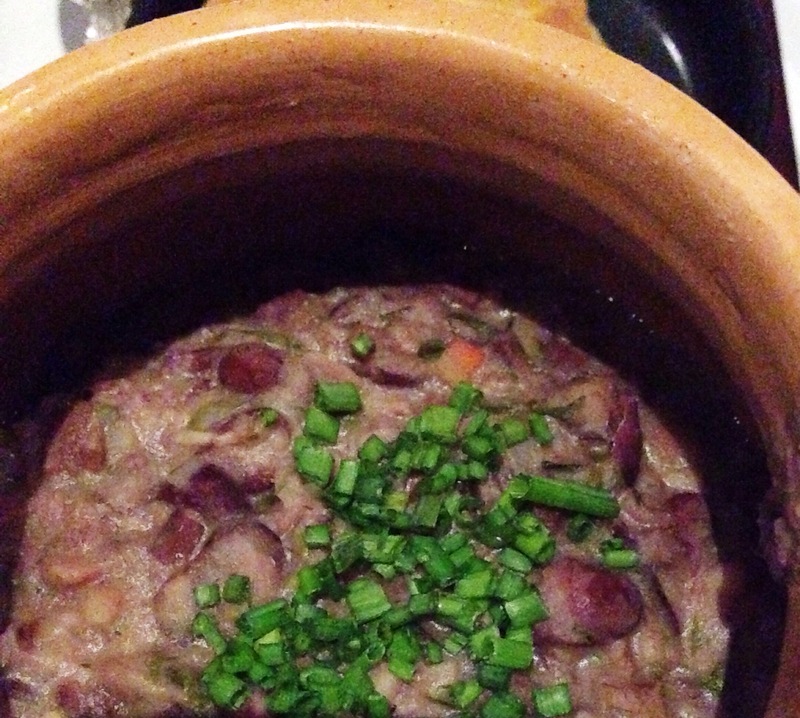 Unfortunately, this version was bland slop, with very little flavour. The pickles that accompanied it tasted strange. Unpleasant, even. We had about two spoonfuls of the stew and gave up. At this point M was getting rather exercised about the lack of authenticity and flavour and telling me that we had to go back to her house, so that she could show me the real thing. 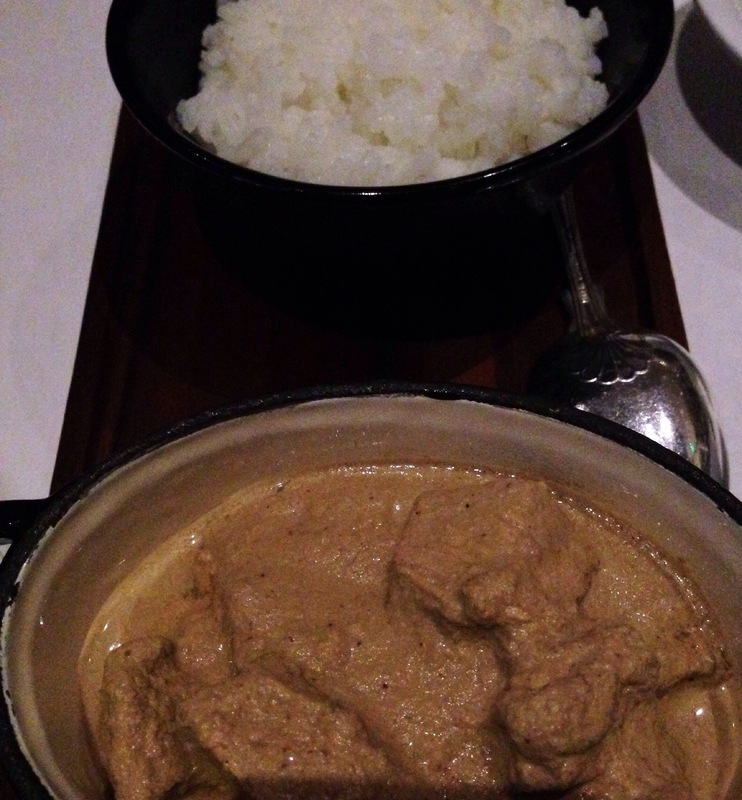 Also unpleasant was the Sacivi, Chicken in a Walnut Sauce with Georgian Spices, served with couscous or rice. M was visibly shocked at the mention of couscous in a Georgian restaurant, like finding bacon on the menu at Blooms: just wrong. M: couscous doesn’t exist in Georgian cuisine. That may be so, but I suspect that it would have been better than the disgusting rice that was served with the inedible, tough chicken. Cooked to the point of melting sogginess, almost like a rice pudding, the rice tasted of nothing other than starchy cooking water. At this point a quite scary- looking man came over to ask if everything was okay. He looked like he might be the owner. He was so forbidding in his appearance that unusually, I felt unable to be entirely honest. I pointed out the dishes that we liked and I was conspicuously silent about the others. This was clearly too subtle an approach. We contemplated dessert. Georgian Yoghurt, Served with a Walnut Preserve, which we almost fancied; Mille-Feuille Puff Cake with Light Mascarpone Cream. M– mascarpone cream not authentic, so we can’t have it. We gave it a miss. At this point the lure of M’s kitchen was too great and we skedaddled out of there. It’s not cheap. And they add “optional service” without telling you how much it is. 12.5%, by the way. Not that there was anything wrong with the service. If the food had been half as accomplished as the service we might have had a decent meal. Leek and artichoke. And walnuts, obv. The damage . With added 12.5% service. Wow. 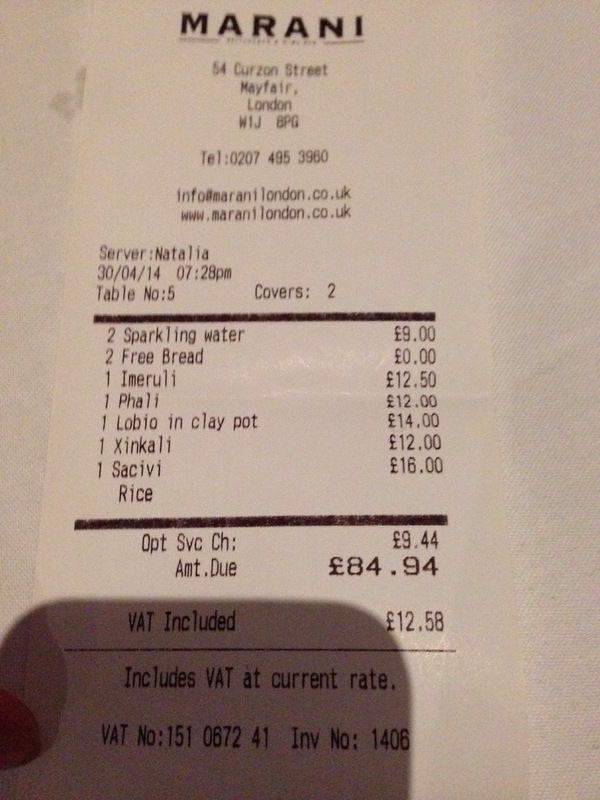 That rice is….er, well, it isn’t. Ex rice. Oh dear. The food at Marani is made to be appreciated by everyone from different parts of the world, if one goes to eat proper Georgian food (as made in Georgia), he won’t be able to eat (or breathe) for the next few days since it is very heavy and not many people can digest as they aren’t used to such food. Do you really think that a 100% traditional Georgian food (which your princess is used to having in her home) is going to be liked in Mayfair? 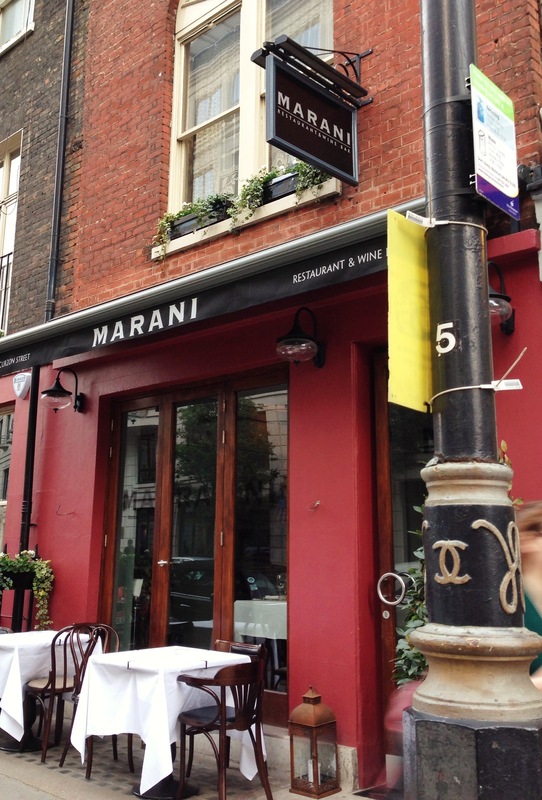 Food in Marani is made to taste as much as it would back at your (Georgian) grandmother’s house with the thought of making it more accustomed to people around Mayfair. (i.e. lighter). When we are talking about Georgian-generosity, I think that applies to our people being welcoming and hospitable to their guest however I doubt that applies in business terms, as if Marani served any bigger dishes I promised 2 people won’t be able to eat two starters and two mains without talking anything back home. Going to a traditional restaurant of a specific country doesn’t mean that they will only serve the food from the country and nothing else. If that’s how you want it, you should only be able to eat bread at an Egyptian restaurant, and drink Vodka at a Russian restaurant, etc. One should appreciate the variety of food instead of complaining about it as none of what you ate is actually Georgian, Dumplings for example have a Mongolian origin. My honest opinion is that you do not realise the whole idea behind this restaurant which is to INTRODUCE Georgian cuisine to London and to do so you need to start with something which is not too indulged in spices that English people have never heard of. You seriously cannot be comparing food in a Georgian restaurant in Mayfair with the one in my grandmother’s village back in Chorvila or any other household as a matter of fact. 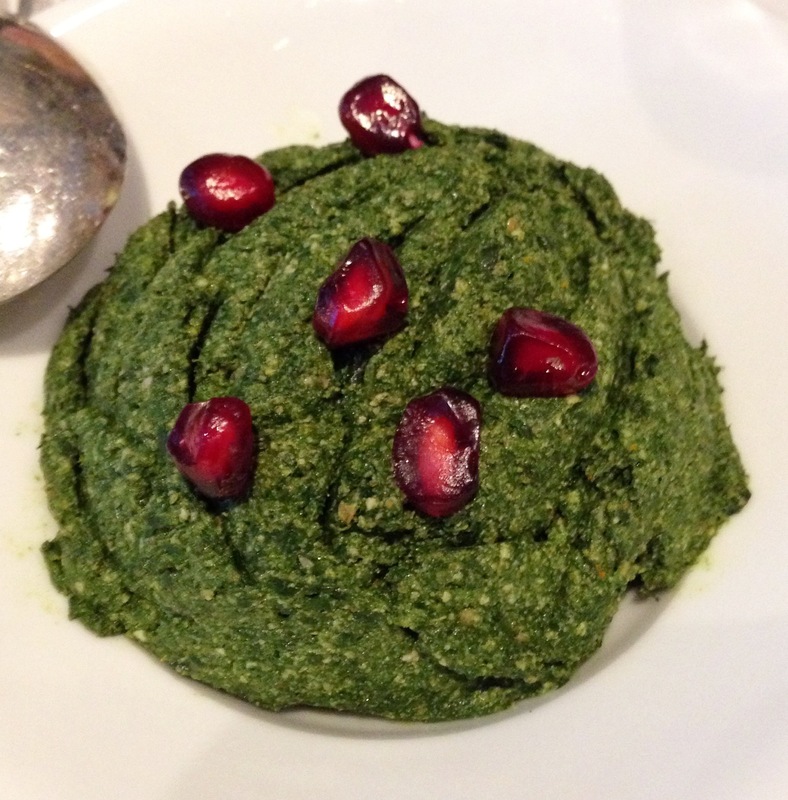 I am probably one of the biggest fans of Georgian food and I have tasted it in many different countries; I can definitely state that Marani has the best Georgian food, not only in England, but probably in the whole world; except from Georgia itself. I have visited Marani 4-5 times since it opened and have never been disappointed, more so, had a lovely evening with finger-licking food. P.S. I agree rice looks terrible and Lobio not so appealing. P.S.S. You really missed out on grilled food and deserts. Natalie, many thanks for that and taking the time to give me such detailed feedback . The reason I went with my friend that she is Georgian and grew up there and is very familiar with the food. I am not. She guided me as to what to choose. I understand the point about it being an introduction but really, the mains were just unpleasant. Maybe we had a bad night, who knows. Sometimes that happens and it colours one’s view. Perhaps it’s worth a revisit on the basis of your experience. Parts of it were good, as I’ve said. But parts were truly unpleasant. And having experienced a little of it with my friend I think that more authentic spicing/seasoning would not put off London diners, who seem able to accommodate new flavours and spices. Marani is truly one of the best restaurant in London , food is just amaizing with those dumplings, I really like them and interior is fantastic seems like they have done good job on it. We Georgians really love food and feasts it is our tradition if you’ll go to Georgia you’ll discover land of food and taste but you can do the same at Marani and taste most of the dishes of Georgian food . I don’t know what others think but I think eating at Marani is an adventure of food, so food lovers ! Marani is the best place to go . Just for the record, I have no intention of damaging the reputation of the restaurant. My reviews are an honest opinion of my experience. I have said where it was good but I have also said where I thought it was not. I will only write what I believe to be true and what I felt about the meal I ate. That is what I have done.